John was the youngest son of Henry II by Eleanor of Guienne, and was born in 1166. Early named governor of Ireland, he was sent over, in 1185, to complete its conquest, but such was his imprudence that it was found necessary to recall him; and on the death of his father he was left without any provision, which procured for him the name of Sans Terre, or Lackland. 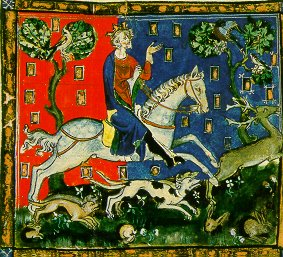 His brother Richard I, on coming to the throne, conferred on him the earldom of Mortaigne in Normandy, and various large possessions in England, and married him to the rich heiress of the Duke of Gloucester. Notwithstanding this kindness, he had the ingratitude to form intrigues, in conjunction with the King of France, against Richard, during his absence in Palestine; but Richard magnanimously pardoned him, and at his death (1199) left him his kingdom, in preference to Arthur of Brittany, the son of his elder brother, Geoffrey. Some of the French provinces, however, revolted in favour of Arthur; but John ultimately recovered them, and his nephew was captured, in 1202, and confined in the Castle of Falaise, whence he was subsequently removed to Rouen, and never heard of more. Suspected of the murder of Arthur, the states of Brittany summoned John to answer the charge before his liege lord, King Philip; and upon his refusal to appear, the latter executed the sentence of forfeiture against him; and thus, after its alienation from the French crown for three centuries, the whole of Normandy was recovered. A quarrel with the Pope Innocent III, who had nominated Stephen Langton to the see of Canterbury, added to the perplexity of the king, whom the Pope excommunicated, and whose subjects he formally absolved from their allegiance (1212). At length John was induced not only to receive Langton as Archbishop of Canterbury, but abjectly to resign his kingdom, by the hands of Cardinal Pandulph, to the holy see, in order to receive it again as its vassal. John had by this time rendered himself the object of such universal contempt and hatred, that the barons determined to limit his power and establish their privileges; and though the Pope censured them, they assembled in arms at Stamford, and immediately marched to London. They were received there without opposition, which so intimidated the king, that he consented to whatever terms they chose to dictate. Thus was obtained (June 1215) that basis of English constitutional freedom known as Magna Carta, which not only protected the nobles against the crown, but secured important privileges to every class of freemen. But while John appeared to be all-complying and passive, he was secretly purposing to disannul the charter. The Pope pronounced a sentence of excommunication on all who should attempt to enforce it; and John, having collected an army of mercenaries, carried war and devastation throughout the kingdom. The barons, taken by surprise, sent a deputation to Philip of France, offering the crown of England to the Dauphin, Louis; who, in May 1216, landed at Sandwich, and proceeded to London, where he was received as lawful sovereign. John was immediately deserted by all his foreign troops, and most of his English adherents; but the report of a scheme of Louis for the extermination of the English nobility arrested his progress, and induced many to return to their allegiance. while the king’s affairs were beginning to assume a better aspect, he was taken ill, and died at Newark, October 19, 1216, in the 49th year of his age, and the 17th of his reign.